The Worldwide Fund for Nature (WWF) and CREON Group have announced results of the fifth Environmental Transparency Rating of Oil & Gas Companies operating in Russia. The announcement ceremony took place at the Analytical Center of the Government of the Russian Federation in Moscow on the 30th of November. The Rating project has been implemented with support from the United Nations Environment Program and with participation of the Ministry of Natural Resources and Environment of Russia and the Ministry of Energy of Russia. Just as in previous years, the rating process has been executed by National Rating Agency, while the Luxembourg-based fund management company Creon Capital participated as a partner in the project. The results of the rating in 2018 both affirmed yesteryear leaders’ standings and revealed new prominent up-and-coming participants. As in the previous year Sakhalin Energy (Sakhalin-2), a joint venture of Gazprom, Shell, Mitsui and Mitsubishi, ranked first, followed by Zarubezhneft. The latter company appears in the top 3 for the first time. Exxon NL achieved the third rank. For the first time, special diplomas were awarded to winners in each of three Rating categories: Surgutneftegaz and Zarubezhneft shared the first rank in terms of ‘Environmental Management’; Caspian Pipeline Consortium (CPC) scored the best result in ‘Environmental Impact’; and LUKoil convinced the rating agency regarding their ‘Information Disclosure’. The high importance of the study was underlined by Denis Khramov, the Minister of Natural Resources and Environment of the Russian Federation: “The public initiatives of the Worldwide Fund for Nature such as the Transparency Rating of Environmental Responsibility of Oil & Gas Companies operating in Russia represent an important input in improving ecological policies in the industry, and are also increasing the public availability of environmentally significant information”. “Recently we have witnessed increasing support and attention to our rating from relevant government bodies such as the Ministry of Natural Resources and Environment of Russia and the Ministry of Energy of Russia, which confirms the importance of ratings in the system of public administration of environmental risks and impacts”, said Alexey Knizhnikov, Oil & Gas Program Leader, WWF Russia. “At the same time, it should be noted that two of four Russian state oil and gas companies, namely NK Rosneft and Zarubezhneft, have been increasingly involved in the rating’s development compared to previous years. Their representatives have always been participating in methodology development and progress review meetings”. Pavel Sorokin, Deputy Minister of Energy of the Russian Federation, also addressed his support to the rating’s initiators: “Improving social and environmental responsibility of companies in the oil and gas sector in Russia is becoming an increasingly pivotal task in the field of public administration and in achieving better competitiveness of Russian business. The non-government initiative to conduct the rating has proven its effectiveness within the five years since the project started. The dialogue between oil and gas companies and the society on environmental safety issues should be actively pursued with this project”. Head of CREON Group und Chairman of Creon Capital, Fares Kilzie, underlined in his speech: “CREON Group in general, and Creon Capital in particular, fully support and promote the idea of “responsible investments”, which promotes the rapidly improving investment climate in Russia. As an investment fund we identify outstanding business opportunities, when Russian oil and gas companies improve their ecological footprint. We are ready to contribute in financing sound projects such as advanced APG processing and LNG as an alternative energy source to replace traditional sources fuels such as Diesel and heavy oil. In this context, I would like to mention NOVATEK as a successful endeavor, that grow to the largest Russian LNG producer. This company pioneers with the implementation of large-scale LNG, which may change the whole industry’s structure. DOWNLOAD the rating brochure (in English). 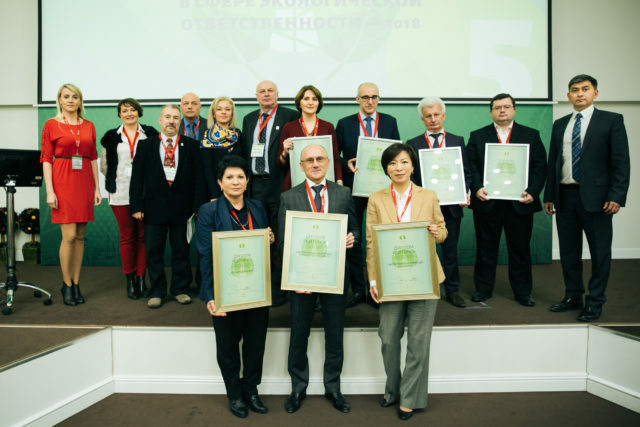 Picture: Representatives of the top-3-ranked companies Sakhalin Energy, Zarubeshneft and Exxon (front row), accompanied by the rating team and the winners of three sub-categories – Surgutneftegas, KTK and Lukoil. The “Environmental Transparency Rating of Oil and Gas Companies” operating in Russia is an independent project, invented by the Fund’s initiator Creon Energy in 2014. More than 30 Russian and international enterprises are being rated annually regarding their environmental policy. The rating is conducted independently by the Russian Rating Agency, according to a sophisticated methodology developed by the Worldwide Fund for Nature (WWF) Russia. In 2018, Creon and WWF also started to rate oil and gas companies in Kazakhstan, a global rating will be conducted soon. For a long time the mostly state-owned oil and gas companies in Russia were closed shops. Reports on environmental sustainability – missing. Manuals how to deal with hazardous situations – out of date. Recultivation projects for oil spills – what for? In the past couple of years the situation has changed tremendously: Even large state enterprises such as Rosneft started to report on environmental responsibility in detail. Lukoil installed solar-based power generation on their oil production plants. And the gas associated with the process of oil refining has increasingly been processed or transferred to pipeline systems instead of being burnt. The rating aims to accompany this process towards more environmental responsibility. The disclosure of information has significantly increased within the five years the rating has been conducted. Companies’ ecologists discuss the ratings results and best-practice examples. The product’s presentation annually turns out to be a gathering of specialists working for competing companies in Russia. But all of them try hard to get the oil and gas production “greener”. In 2018 the rating’s results have been presented in the Analytical Center of the Russian government, representatives of several ministries attended the event. The methodology behind the rating of oil and gas companies in terms of environmental transparency and responsibility has been developed in 2014 and reviewed since then on an annual basis. Every year all Russian oil and gas companies are invited to participate in a round table discussion with WWF specialists to discuss the details and propose changes. Large companies such as Rosneft and Lukoil contribute to this discussion constructively just as much as smaller producers such as Salym Petroleum. According to the metholodology the rating agency assesses the oil and gas companies along the value chain from hydrocarbon production, processing to transportation. The amount and quality of disclosed information is crucial for their placement in the rating, but also the way how comapnies deal with accidents, whether they inform about it or deploy a harzard prevention and risk management system. Also the producers measures to process associated petroleum gas (APG) during the refinery process matter, some still burn APG instead of using it.